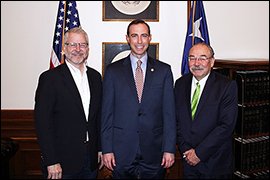 AUSTIN – Texas Secretary of State David Whitley today hosted a meeting with Texas Democratic Party Chairman Gilberto Hinojosa and Republican Party of Texas Chairman James Dickey to discuss ways to improve communication and efficiency in election administration in the State of Texas. 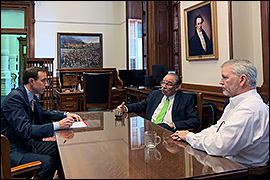 Secretary Whitley heard from both party chairs on issues relating to anticipation of higher turnout in future general elections, as well as primary election administration, in which both the Secretary of State's office and political parties have statutorily-created administrative roles. All meeting participants agreed to work collaboratively and enhance coordination in order to better serve Texas voters in future elections.